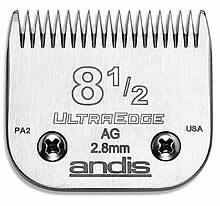 Andis #8-1/2 Full Cut Clipper Blade for Large Animals (Cattle, Horse) - Leaves Hair 7/64"
Blade Description: Large Animal 64170 USA Detachable Blade 8-1/2 2.8 UltraEdge. A useful blade to use when clipping the crown of the head and arch of the neck of a Cocker Spaniel and similar sporting breeds. Also considered effective on the cheeks and front of the neck of sensitive Poodles to produce a very smart finish. A wide range of attachment combs can be fitted over these blades to provide increased cutting length. Comb attachments should only be used on well-groomed coats and not those, which are tangled or matted.